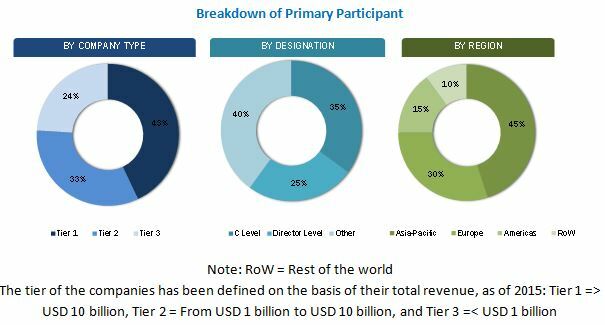 [160 Pages report] The global cryogenic equipment market is expected to grow from an estimated USD 16.18 Billion in 2016 to USD 22.42 Billion by 2021, at a CAGR of 6.74% from 2016 to 2021. Factors such as increasing demand for LNG and improving healthcare services, especially in the developing economies are driving the market worldwide. This research study involved extensive usage of secondary sources, directories, and databases (such as Hoovers, Bloomberg, Businessweek, and Factiva) to identify and collect information useful for this technical, market-oriented, and commercial study of cryogenic equipment. The points mentioned below explain the research methodology applied in making this report. The cryogenic equipment market starts with the manufacturing of equipment such as tanks, valves, vaporizers, and pumps, among others. Linde Group AG (Germany), Chart Industries, Inc. (U.S.), and VRV S.p.A. (Italy), among others are the leading equipment & service providers. The final stage covers application in the end-use industries such as energy & power, chemical, metallurgy, and electronics, among others. The cryogenic equipment market is projected to grow at a CAGR of 6.74% from 2016 to 2021 to reach USD 22.42 Billion by 2021. Increasing demand for LNG and improving healthcare services, especially in the developing economies are the major factors driving the market. The report segments the cryogenic equipment market on the basis of cryogen type into nitrogen, oxygen, argon, LNG, and other cryogens. Although the oil & gas sector is witnessing a downturn, the LNG segment is expected to grow at the fastest pace. LNG demand is increasing across the globe and this demand is attributed to increase in gas-based power plants and shifting of locomotives and marine transport toward LNG for fuel. 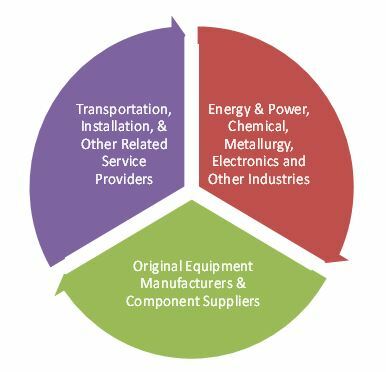 Based on end-user, the energy & power sector is the largest end-user for cryogenic equipment among all the industries. Transportation and storage of LNG is the major application of cryogenic equipment in the energy and power sector. The natural gas segment in the energy & power sector has transformed due to technological advancements and made extraction of natural gas economically viable. Moreover, countries such as the U.S. and China are focusing on reducing carbon emissions, which is expected to increase gas-based generation. With this positive outlook, the demand for cryogenic equipment in this sector is likely to grow during the forecast period. In this report, the cryogenic equipment market has been analyzed with respect to the following regions, namely, North America, South America, Europe, Africa, the Middle East, and Asia-Pacific. Asia-Pacific is currently the largest market for cryogenic equipment, and the market in the Middle East is projected to grow at the highest CAGR during the forecast period. China accounted for the majority share in Asia-Pacific in 2015. In Asia-Pacific, the growth of the cryogenic equipment market can be attributed to factors such as increasing investments in the energy sector and substantial growth in other end-user industries such as food & beverage, healthcare, and electronics among others in this region. The figure given below shows the regional scenario of the cryogenic equipment market from 2016 to 2021. The demand for cryogenic equipment can be directly linked to the LNG demand. The demand for cryogenic equipment is also driven by improving healthcare services, especially in the developing economies. However, decrease in global steel production could restrain the market growth, and problems associated with cryogen leakage are a significant challenge for the market. On the other hand, the increase in infrastructure spending, space applications for cryogenic technologies, and cryogenic energy storage systems represent promising growth opportunities for the market. 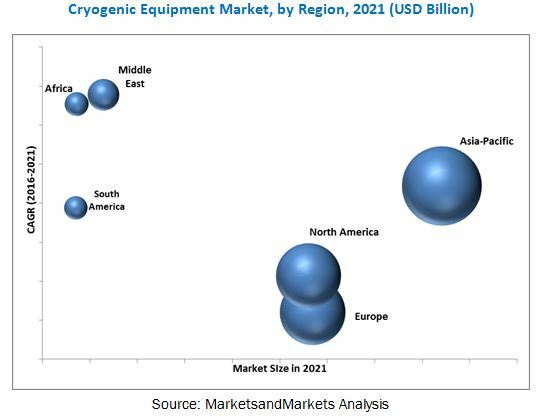 Some of the leading players in the cryogenic equipment market include Linde Group AG (Germany), Flowserve Corporation (U.S.), Air Liquide (France), VRV S.p.A. (Italy), and Chart Industries, Inc. (U.S.), among others. Contracts & agreements was the most common strategy adopted by the top players in the market, constituting more than one-third of the total development share. It was followed by new product launches, mergers & acquisitions, and expansions, respectively. 11.3 Beijing Tianhai Industry Co., Ltd.